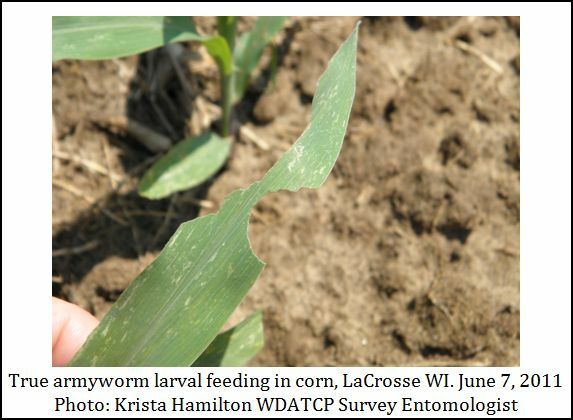 The insect feeding activity report of note I received this week is that of true armyworm larvae on corn in LaCrosse County in Western Wisconsin. 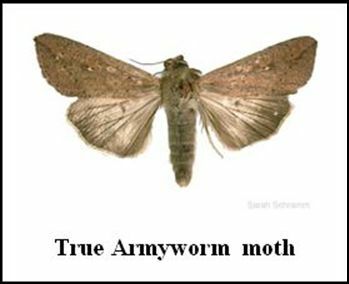 I have also recorded an increase in true armyworm moth numbers in the weekly black light trap that my lab runs at Arlington Agriculture Research Station in southern Wisconsin with 86 moths last week and 56 moths this week. Now is the time to start paying attention to corn and winter wheat for true armyworm larvae. We tend to see high populations or outbreaks following a cool wet spring. Delayed grass weed control can provide an egg-laying source for moths. This first generation that we see in the field in June results primarily from migrating moths from southern states. During the later part of July we will see a second generation that can sometimes be an economic factor in corn. Steve Huntzicker, UW Extension LaCrosse County Agriculture Agent and Krista Hamilton WDATCP Survey Entomologist scouted several infested fields on June 7th in northwest LaCrosse County north of Holman towards Galesville. They estimate the number of plants showing leaf damage ranged from 18-40% in the four fields checked. Many larvae were ¼-inch to 1-inch long, two per plant in a few cases. Additionally, Steve checked one farm in southwest Monroe County near the Cashton area and found a small percent of plants infested, less than 2% in four fields on the farm. Larvae were very small and he had to search for them. Steve noted that the fields in which he has found True Armyworm larvae over the past couple of days have been corn fields following sod. Grasses and small grains are the preferred egg-laying sites for female moths. For first generation, corn fields with crop residue, weeds or dead grass should be watched closely. Presence of grass weeds will attract moths for egg laying. Corn fields preceded by a winter rye crop may also attract female moths. As small grains are cut or grass weed hosts dry down, armyworm larvae can move quickly to corn, this can happen following a herbicide burn down in no-till or conventional tillage fields. Adults seek areas of dense cover to lay eggs. For that reason, concentrating scouting efforts around weed escapes can be a good place to start. The greenish white eggs are laid in rows or clusters on leaves. One week to 10 days after the eggs are laid, larvae begin to emerge and feed. After 3-4 weeks, larvae pupate for 2 weeks and emerge as adults. There are three generations per season, each generation lasting approximately 5-6 weeks. The success of the first generation will set the stage for 2nd generation later in July. (The third, fall generation is typically not injurious and is often heavily parasitized by beneficial insects, fungi and viruses). True armyworm larvae are brownish green, hairless, and have white-bordered stripes running laterally along the body and dark bands at the top of each abdominal proleg. The head is yellow-brown with a network of dark brown lines creating a pattern. The adult moth is sand colored with a small white spot on the center of each forewing. There are six larval instars, reaching approximately 1.5-inches when full grown. The closer larvae get to this length, the shorter the duration of time for them to feed before pupation. Insecticide treatment recommendations are based not only on the number of larvae but also on length (smaller larvae will continue to feed for a longer time). Larvae tend to feed at night or on cloudy days and hide in soil or under foliage during the day. Leaf feeding begins from the outer leaf margins, inward toward the leaf midrib – giving corn leaves a ragged appearance. Scout several areas in the field, checking 5 sets of 20 plants. Armyworm economic thresholds for corn are 2 or more armyworms at ¾-inch length or smaller per plant on 25% of the plants, OR, 1 armyworm ¾-inch length or smaller per plant on 75% of the plants. In wheat and pasture grasses examine the soil between two rows at several points in the field and determine the number of larvae per square foot. In small grains armyworm damage may be more severe in lodged areas. Populations at 3 larvae per square foot justify treatment. Later, as wheat reaches physiological maturity, head clipping will be of more concern than leaf feeding although true armyworm does not always switch to head clipping in wheat. (Something to watch for as the wheat crop matures). 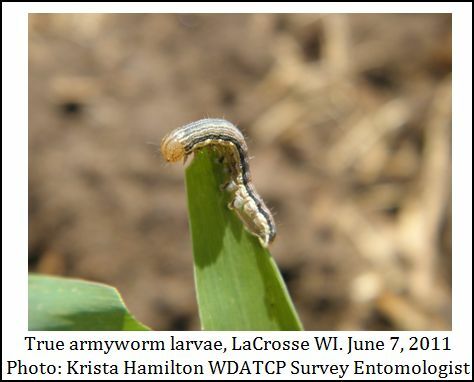 Consult UW-Extension bulletin A3646 Pest Management in Wisconsin Field Crops for insecticide label information for armyworm in corn, small grains and pasture if economic thresholds are reached. Keep in mind; none of the Bt corn rootworm or corn borer insect trait corn hybrids list true armyworm on the spectrum of control or suppression and we do not have good data on this to date. Some anecdotal field observations from 2010 suggested some suppression from some Bt hybrids. Nevertheless, Bt fields should be scouted for armyworm activity along with other corn fields.